Since the division of Sudan in 2011, Algeria is the largest country of Africa. It shares borders with Morocco (1,559 kilometres), Tunisia (965), Libya (982), Niger (956), Mali (1,376), Mauretania (463) and the Moroccan-occupied Western Sahara (42 kilometres). In most cases, the borders were delineated by the European colonial powers, especially France. This caused problems in the postcolonial era, when Morocco claimed large parts of south-western Algeria, leading to the brief ‘War of the Sands’ in 1963. Border issues between Algeria and Libya were more easily resolved. The southern borders, drawn in the Sahara desert, are not easily guarded, providing opportunities for smuggling and illegal migration. 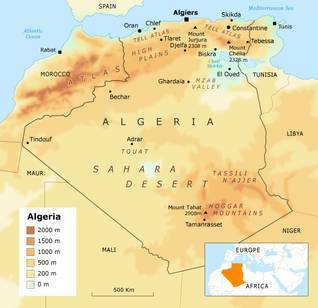 Algeria consists of three main geographical zones, each with its own climate. In the north, the Mediterranean Sea dominates the fertile coastal plains that extend up to the Atlas Mountains. On the other side of the Atlas, the High Plains (Hauts Plateaux) form a semi-arid zone. The largest part (about 80 percent) of the country consists of the Sahara desert. The Mediterranean coast in the north is rocky, with scattered sand beaches. Many bays are formed where the mountains reach the sea. Conquering armies, such as those of Carthage and Rome in ancient times and the Turks much later, were attracted by the bays, because they could serve as natural harbours for their merchant and war fleets. Other invaders soon discovered the enormous agricultural potential of the coastal plains. For the Romans, the cultivation of grain in these fertile areas made Algeria the breadbasket of the empire. During French rule, the country became a major supplier of wine and of fruits such as oranges. As the home of most Algerians up to the present, the coastal plains include the big cities and the major industrial centres that were created by independent Algeria. 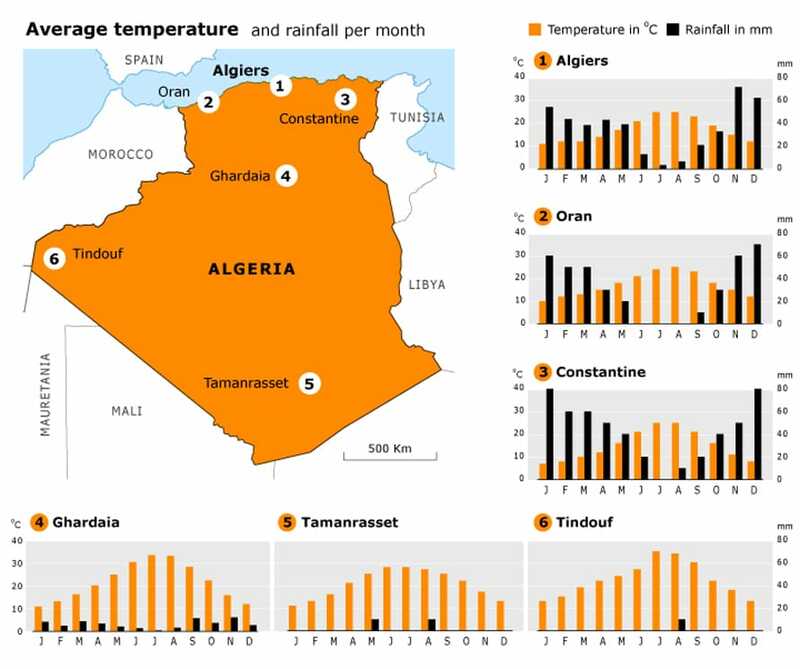 The climate in the north is typically Mediterranean: summers are generally hot, and winters are moderate but can be very rainy. This has obliged the country to make substantial investments in water management. The northern cities have long suffered from shortages of drinking water during the summer. Through the use of artificial lakes, the improvement of water pipelines, and the construction of desalination plants, the situation has improved recently. In winter, the abundance of rain often causes problems in urban areas, where infrastructure has been neglected. The Atlas Mountains are never far from the coastal plains, and the rocks seem, in some places, to plunge right into sea. Stretching from east to west, the mountain range forms a natural barrier between the coastal plains and the interior. Throughout history, the Atlas has allowed rural communities in mountain valleys and in remote desert and plain regions to live isolated from the rest of the country. 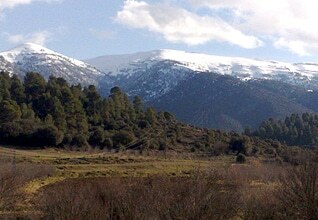 With summits – such as that of the famous Jurjura Mountain in the Kabylia region –over 2,000 metres, the Atlas range can accumulate deep snow in winter. In contrast, the High Plains that extend south of the Atlas get far less rain. Winters can be cold, and summers are hot. The plains consist of grasslands and small bushes that traditionally provided pasturage for sheep and goats. In earlier times, the long grass was also used in basket-making. Given these limited economic possibilities, many inhabitants of the plains have moved to the cities and towns, which have grown considerably as a result of this migration. The water supplies in the plains area are concentrated in natural reservoirs. These chotts are marshes (often salty) in low-lying areas. Futher south, the High Plains are delimited by the Anti-(or Saharan) Atlas, which are not as high as the more northern Atlas range. Four-fifths of the country lies in the Sahara desert. The Sahara is very hot in summer, with temperatures that can reach more than 50˚C. In winter, daytime temperatures are comfortable, but night can be freezing cold, because much of the heat originating from solar radiation during the day can escape the surface through the cloudless night-time sky. The driest parts of the Sahara can remain rainless for years, but unpredictable rains sometimes fall in torrents that can have a devastating impact. The desert city of Ghardaïa, for example, experienced large floods in October 2008. The desert may appear harsh and unwelcoming at first sight, but it contains many treasures. There are the underground riches of oil and natural gas that have shaped the course of Algerian history since independence. In addition, precious metals are found in the remote corners of the desert. The surface of the desert has several remarkable features. 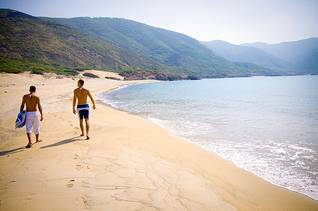 Far from being a uniform mass of sand, the Algerian Sahara offers a varied landscape of mountain ranges, sand dunes, rocky plateaus, and oases filled with thousands of palm trees. Underground water resources made possible permanent settlement of communities in oasis towns. El Oued (called the town of a thousand domes) and Biskra, in north-eastern Algeria, are major date-producing regions. In the west, the string of oasis towns in the Touat region have been important staging posts for the trans-Saharan trade for hundreds of years. The central area of the Mzab valley, with its main town, Ghardaïa, has historically been home to the Ibadi religious minority, constituting a successful trading community. 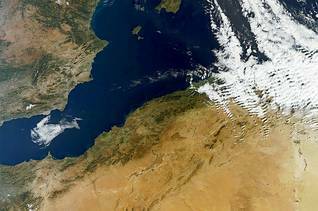 Millions of years ago the Sahara was part of a sea. Once the water receded, the processes of erosion by wind and water – a few thousand years ago, it had a climate characterized by abundant rainfall – created the most remarkably-shaped rocks and mountains, especially notable in the Hoggar and Tassili n’Ajjer regions, which are, for that reason, major tourist destinations for travellers to Algeria. Rock carvings dating back about 7,000 years have been discovered in the Tassili n’Ajjer. The variety of animals shown in these pictures is a good indication of the very different climate prevailing then. The Tassili n’Ajjer (‘plain of rivers’) still contains much groundwater, held in the sandstone that predominates there. A geological feature that has occasionally affected the country severely is the location of northern Algeria in the zone where the African and European tectonic plates meet, resulting in a high risk of earthquakes. The most populated areas in the coastal plains lie on the edge of this zone. Some places are extremely prone to disaster, such as the city that was known as Orleansville in colonial times. After it was destroyed by an earthquake in 1954, it was rebuilt after the war of independence and renamed al-Asnam but suffered the same fate in 1980, leaving thousands dead. After that disaster it was rebuilt and renamed Chlef. In 2003 a major earthquake hit the region of Boumerdès, close to the capital, where a thousand people lost their lives and buildings were destroyed. Each climate zone has its own plant and animal life. In the north, the species resemble those of other countries bordering the Mediterranean. Because this region also includes the most cultivated, urbanized, and industrialized parts of the country, its environment is under pressure. Many species survive in refuges in the nearby mountainous regions, where oaks, pines, and the Atlas cedar abound. Wild boar and the occasional bear survive here, as do the often more visible groups of monkeys. South of the higher Atlas peaks, the lower rainfall makes for far less vegetation and animal life. But even the desert is far from lifeless, as it contains many plants and animals that have adapted to the harsh environment, making efficient use of the scarce water resources. Among these species are lizards and snakes and some insects, but also a few mammals, such as antelopes, jackals, desert rats, and foxes. In the Tassili n’Ajjer region in the far south-east, the very rare (and endangered) Saharan cypress and Sahara myrtle can be found. The Mediterranean Sea has always held abundant fish, which provided a living for many coastal communities, but some species are becoming rare on account of overexploitation and pollution. Corals and sponges are used in industrial applications. Algeria’s main natural resources are its hydrocarbons – oil and, above all, natural gas, of which the country is a major producer in the global market. Oil reserves are about 1 percent of proven global reserves. Currently Algeria is the twelfth largest exporter of petroleum in the world. In order to process the crude oil, the country has built a significant oil-refining and petrochemical capacity. Most oil products now go to the growing domestic market, making the oil industry a less important source of external revenue. With 2.2 percent of the world’s proven natural gas reserves, Algeria is less important than major producers such as Russia, Iran, and Qatar. Algeria accounts for 2.4 percent of global gas production. Domestic consumption per capita is, however, lower than in other gas-producing countries, leaving a relatively large share for export. Major oil and gas fields lie in the northern Sahara. The production of oil began in 1956 in the desert region of Hassi Messaoud. Some years later, large deposits of natural gas were found near Hassi R’Mel. Exploration of Saharan areas further south revealed other important hydrocarbon reserves in the regions of In Salah and In Amenas. The country also has substantial reserves of iron ore (which has formed the basis of the Algerian steel industry), and precious metals such as gold, and diamonds. Most of these rare minerals are found in the remote Sahara, often making the costs of exploration and the infrastructure needed for exploiting these resources economically prohibitive. In order to promote extraction of these resources, the government has offered mining companies from Canada, China, and Australia favourable terms for investment in the country. Algerian state enterprises have formed joint ventures with these foreign firms in order to expand production and gain access to state-of-the-art technology for exploiting precious metals. This has resulted particularly in an increase in the production of gold. Water is scarce, both in the desert and in the heavily populated north. The government is trying to improve the situation by building or reconstructing dams to create water reserves. An alternative though more expensive option is to produce drinking water from seawater by desalination. Over the last decade, large investments have been made in the development of desalination plants. Some fifteen installations have been planned, about half of which have been completed. Despite the costs involved and the technical difficulties, this programme, involving specialized foreign construction firms, is of sufficient strategic importance that the state is continuing them. In the Sahara, other solutions have to be found that are not always sustainable. Drinking water for the expanding desert city of Tamanrasset has to be supplied by a long pipeline from other oases to its north. An important future resource is solar energy generated in the desert regions. 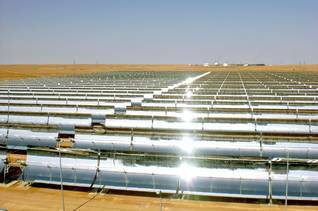 Algeria is involved in the international DESERTEC programme, which aims to make solar energy from North Africa available to European electricity grids. The programme may allow all the parties involved to reduce their great dependence on the trade and use of hydrocarbons, which are pollutants and contribute to global warming. With the onset of the financial and economic crisis in Europe and, from 2011, political turmoil in North Africa, many investors have hesitated to honour their commitments. This casts doubt on the short-term feasibility of DESERTEC, although the longer-term advantages still seem clear. Most of Algeria’s fertile land is found in the coastal plains, in the traditional agricultural areas such as the Mitidja Plain around the capital Algiers. During the French colonial era, this region became an important source of grains and fruits such as oranges and figs. After independence, the devastation of the war and the government’s orientation towards the buildup of industry led to a neglect of the region’s agricultural potential. The Atlas Mountains are home to nut and fruit trees as well. Wine grapes, one of the main products in colonial times, are still being grown, particularly in the region of Mascara, in the north-west. Algerian wine can be found in some major restaurants in the big cities and is also being exported in limited quantities. In the Saharan region, many oases have also long been cultivated. 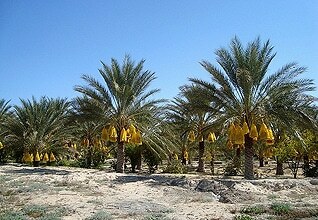 The desert contains significant groundwater reserves that permit palm trees and some other crops to grow. The most famous products are the dates from the regions of Tolga and Biskra; they are the most important export product after oil and gas. The inhabitants of the oases have also been able to cultivate vegetables that need more water by drilling wells, building irrigations systems, and creating a network of low walls to keep the sands out. The environment is under threat from many directions. Industrialization, population growth, the war of independence, and the civil war of the 1990s have left their traces in the landscape and the ecosystem. Attempts to bring steppe areas under cultivation have resulted in the depletion of the soils, and ecosystems are being changed by desertification. 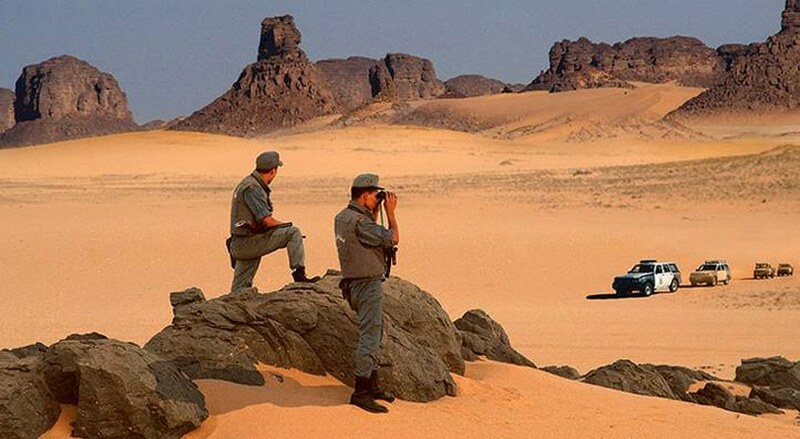 In the 1970s especially, the government put much effort into creating a ‘green barrier’ of trees at the borders of the Sahara in order to slow down the desert’s northward expansion. This programme, managed by the army, has been only partly successful. The variety of tree species planted was insufficient, which prevented the creation of a true ecosystem, and those that were planted were often were eaten by sheep and goats. Over the years, however, the awareness of desertification and the environmental impact of economic activities has grown. Although economic development has always dominated the agenda, the state now acts more forcefully on environmental issues. Most successful has been the designation of national parks, mainly in the south. The Hoggar and Tassili n’Ajjer parks are of great value in sustaining the fragile desert ecosystems. Important to this success has been the involvement of the local communities, for whom the desert also brings new economic opportunities, as the parks have become main tourist destinations.